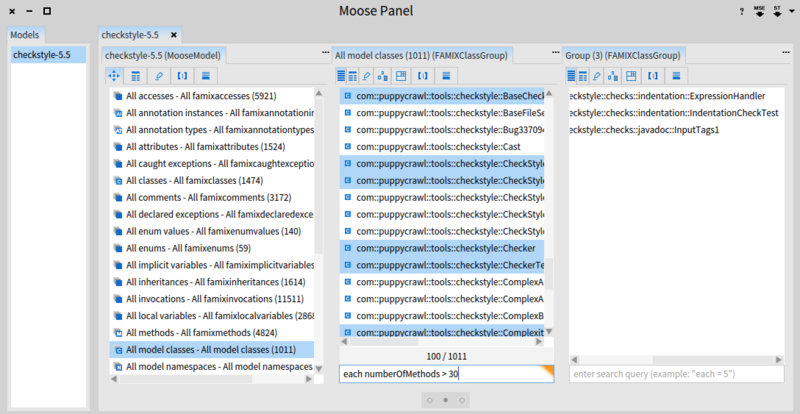 Moose is a platform for data and software analysis. Moose is the result of a collaborative effort, initiated at the University of Bern, which now comprises several companies and research groups spread all over the world. The website of Moose is http://moosetechnology.org. Visualization plays an important role in assessing the quality of a software. The source code defining a software may be very large and is characterized using a wide range of metrics and structural properties. Identifying anomalies, and more importantly, proposing actions to improve the quality is difficult. It is known that visualization greatly alleviates software maintenance. Moose is often used to craft specific software engineering tools that guide engineers in making proper decisions about the course of a software development. Humane Assessment is a method designed by Tudor Gîba and largely described on the website http://www.humane-assessment.com. What Moose is good for: Moose is made to carry out analysis on the source code structure. A whole range of analyses may be conducted by analysis source code. Moose is also frequently used to analyze configuration files, process descriptions, or mailing lists. What Moose is not good for: Moose cannot directly be used to analyze the dynamic execution of an application. Dynamic analysis consists in recording relevant information during a program execution. Such information may then be used to spot particular behavior. Panel: An extensible tool to navigate, visualize, and formulate queries. Parsers: Two parsers are shipped with Moose. MSE is a file-format describe source code models. MSE is typically produced by externally provided parsers. The Famix metamodel: An abstract representation of source code. Famix is generic and it may describe applications written in Java, C, C#, and Pharo. 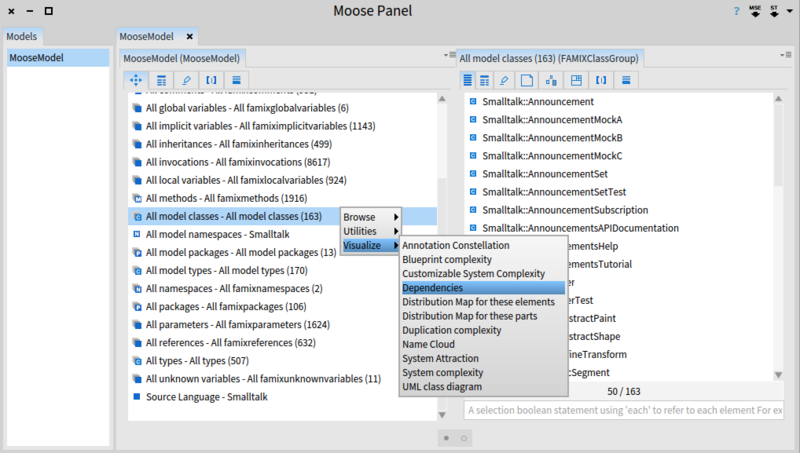 Creating a model in Moose is probably the very first step to take. Such a model will contains all the software elements on which your analyse will be carried out. The standard way to create a model is to load an application. To do so, the Moose panel has to be open. The panel is accessible from the World menu (Figure 2.1). Moose has two built-in parsers: one for Pharo, and another for MSE. 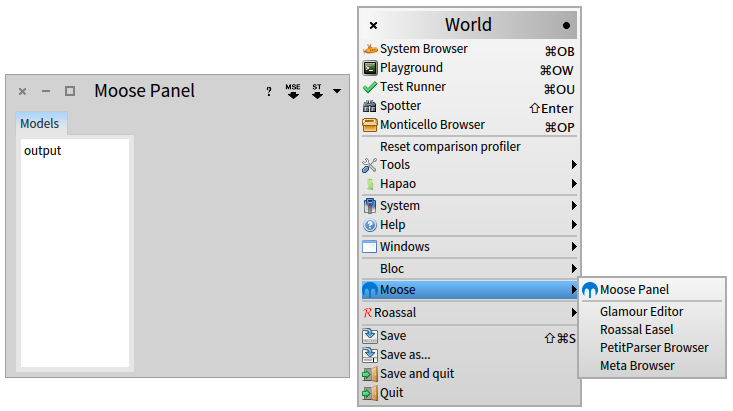 The first parser is accessible by clicking on the ST icon, top-right of the Moose Panel. Clicking on it will open a package selector. You simply have to select the Pharo packages you wish to include in your model. The second parser takes as input a MSE file, accessible by clicking on the MSE button. Producing a MSE file from Java source code is done using VerveineJ. Unfortunately, at the time this chapter was written, VerveineJ has a proprietary license. Contact the book author or the Moose mailing list for more information. Along this chapter, we will use a running example, obtained from the Java application checkstyle. Checkstyle is a development tool to help programmers write Java code that adheres to a coding standard. The source code of Checkstyle is available from its website: http://checkstyle.sourceforge.net. We have produced a MSE file, available on http://bit.ly/checkstyle. After having loaded the checkstyle MSE file, a new model is listed in the Moose (Figure 3.1). The item All classes lists all the classes defined in the application and all the classes used by checkstyle that are not defined in it. Some examples of such classes are Object, String, Integer, which are defined in the Java runtime. Select the All model classes item to list all the classes defined in the applications. Below the list of classes, a text input accepts filtering queries. Enter each numberOfMethods > 30. A third pane appears and lists the classes defined in checkstyle that have more than 30 methods (Figure 3.2). Since the items displayed in the panel All model classes are instances of the class FAMIXClass, the each variable refers to an FAMIXClass. Browsing this class using the Pharo code browser will give you the list of methods that are understandable by the each variable. designates classes defined in Checkstyle that have the word Log in their name. The string being an expression regular, matched using match:. Another relevant query to type in is: each isStub. You need to select the item All classes instead. This simple query filters out all the classes that belongs to the checkstyle application, to leave the classes are used by Checkstyle. Said in other words, all the externally provided classes used by Checkstyle are remains. This is handy to assess external dependencies. In the Moose jargon, a stub class is a class that is used by the analyzed application but not defined in it. 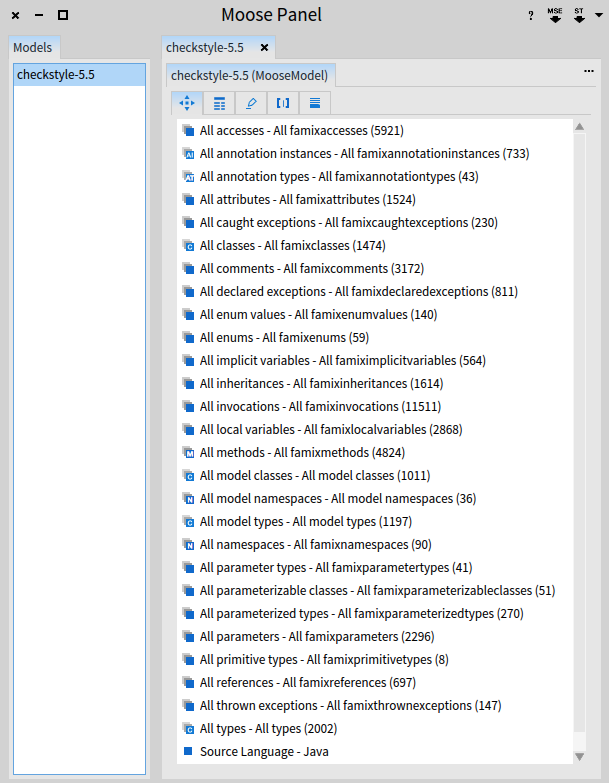 Checkstyle contains 398 stub classes, corresponding to classes defined in other libraries, not part of the .MSE file. For example, Checkstyle depends on some libraries provided by the Apache foundation or Google. These libraries are not part of the .MSE file. This query returns the classes that override more than 1/3 of the classes that it inherits. Such classes are rather suspicious since it may be worth considering whether they belong to the adequate class hierarchy. Checkstyle contains more than one thousand classes, distributed over 36 packages. Understanding the code distribution over these packages may involve a dedicated visualization. After having selected the checkstyle model, select the packages by pressing All model namespaces. The new pane located on the right-hand side lists these packages. Oddly enough, the packages <Default Package> and blah are listed. b nodes: (self reverseSortedAs: #numberOfClasses). This simple visualization shows that not all the packages contain the same amount of code. The first package, the largest, is com.puppycrawl.tools.checkstyle. Clicking on the package opens up a new pane. The second tab gives the list of properties for that package. In indicates that it defines 142 classes, spread over 5,617 lines of code. b nodes: (self reverseSortedAs: #numberOfMethods). Most of the classes are small, in terms of lines of code, number of defined methods and attributes. Moreover, only two of these classes are subclasses. The script colors in blue classes that have at least one method with the word error in it and in red classes that are visiting some entities. The hierarchy of red classes indicates a specialization of visitors. Notice that that errors are rarely handled. connectToAll: [ :cls | cls queryAllOutgoingInvocations atTypeScope ]. Sending the message queryAllOutgoingInvocations to a Famix class returns a list of Famix invocations. An invocation is an instance of the Famix class FAMIXInvocation. Invocations represent a low level abstract that often need to be transformed. Such transformation is called setting a scope by Moose Chef. The invocations may be scoped to the classes by sending atTypeScope. For a given Famix class cls, the expression cls queryAllOutgoingInvocations atTypeScope returns the list of Famix classes that cls depends on. A Chef query may be scoped using atNamespaceScope, atPackageScope, atTypeScope, atMethodScope. So far, we have defined some visualizations within the tab [|]. This allowed us to play with and tune the visualization as we need. Once satisfied with a visualization, you may want to install it permanently, quickly launch the visualization for a different set of classes. One easy way to install a visualization, is to create a method on the class describing the group you are interested in. For example, if you wish to make a visualization for a group of classes, then FAMIXClassGroup is probably the class you wish to install the visualization in. First, you need to inspect the class behind the group you are interested in, as shown in Figure 7.1. This opens a new window titled Inspector on a FAMIXClassGroup. Click on the pencil icon (Figure 7.2). Moose is a large project that contains many exciting facets. This chapter only superficially highlights some of them. Another good source of documentation is the Moose Book (http://www.themoosebook.org/book), project lead by Dr. Tudor Gîrba http://www.tudorgirba.com.